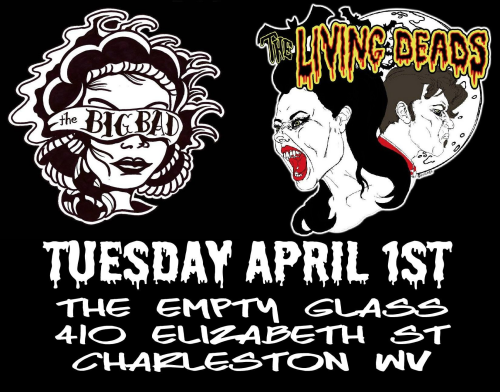 If all goes well, the RFC cameras will be on hand to record The Living Deads and The Big Bad Tuesday night at 10 PM The Empty Glass. 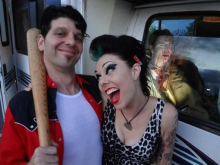 The Living Deads take Do-It-Yourself to a new level. From living full time in their RV, designing and printing their own t-shirts, to booking their own tours, this band takes it all upon themselves and they are still ready for more. The Big Bad are old buddies of Radio Free Charleston and you just need to hear their music to be convinced to come out to hear the band. The show is supposed to start at 10 PM, even though some sources say 9 PM. There is no announced cover charge, but I’m guessing it’ll be seven bucks, or maybe five. Go there with plenty of money anyway so you can buy merchandise from both bands. Last month I told you about Roots Town Radio, the looming new low-power radio station that’s hoping to serve Charleston’s airwaves with plenty of local music. The good news is that thanks to a hefty donation from The Greater Kanawha Foundation, WXDB is more than halfway to their fundraising goal to start pumping out local goodness on the FM dial at 95.7. However, it’s a busy week for fundraising for WXDB. 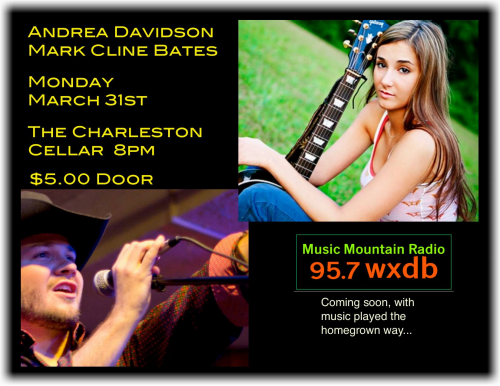 Tonight at The Cellar (8 Capitol St.) at 8 PM, you can enjoy music by recent Radio Free Charleston guest, Mark Cline Bates as well as singer/songwriter Andrea Davidson. Five bucks gets you in the door, and it all goes toward helping Roots Town Radio become a reality. 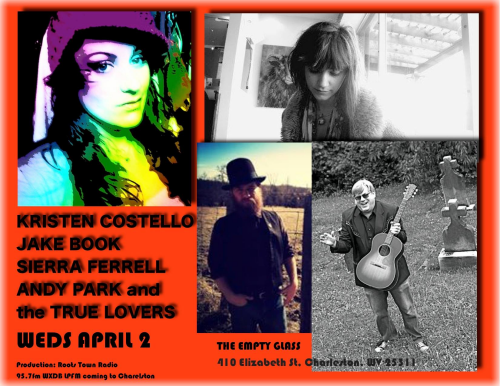 Wednesday night, The Empty Glass plays host to a Roots Town Radio night, with Kristen Costello, Jake Book, Sierra Elizabeth Ferrell and Andy Park and the True Lovers. The five dollar cover goes to the band, but this is to raise visibility for the RTR project. 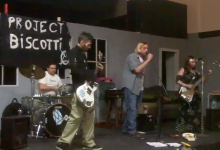 Episode sixteen of The RFC MINI SHOW presents Project Biscotti, one of Charleston’s most intriguing bands. With a sound that blends cabaret, raw punk and high-energy rock, they’re unlike any other artists in town. They’re the closest thing we have to Captain Beefheart. This episode presents two crisp, punky tunes, but in the spirit of creative anarchy, and as our nod to April Fool’s Day, if you stick around after the end credits, you’ll get just a little more Biscotti to gnaw on. So be advised that this show may push the boundaries of what is considered safe for work. Blasting it really loud in a church is also not advised, although it would be hilarious. This episode of The RFC MINI SHOW was recorded “guerilia style,” and as such, the audio is less than perfect. We promise better audio the next time we have these musicians on the show. Still, in the spirit of “New Wave Theater,” we felt you might enjoy this raw, vital music, and the tiny, little, wee Easter Egg that you’ll find after the end credits. This week’s art is a simple digital painting, with no special effects or textures or anything like that. It’s an exercise in sillhouette and color composition. 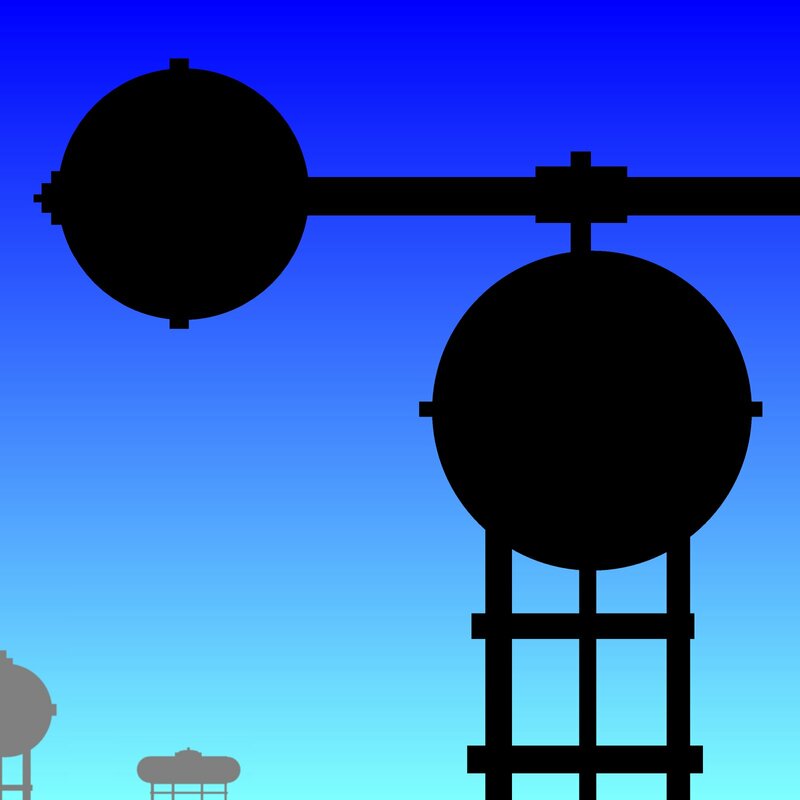 I was trying to create a credible, yet totally imaginary scenario using simple shapes. That it came out looking a bit like a tank farm might be an indication that January’s chemical spill on the Elk River is still poking around in the recesses of my mind. Click to enlarge and come back to PopCult later Monday for a special RFC MINI SHOW starring Project Biscotti, and a preview of stuff to do early in the week. 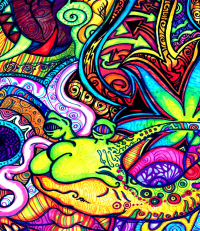 It may be hard to believe now, but back in the 1960s and 70s the scary and subversive counter-culture had so permeated the mainstream that advertisers hoping to reach the “youth market” jumped at the chance to incorporate drug-influenced graphics, swiped from underground comics and cutting-edge designers like Milton Glazer and Heinz Edelmann. The end result now seems quaint, but it’s pretty to look at, so here’s an assortment of animated commercials from the era. It’s pretty hilarious when you consider how subversive this imagery was considered at the time. You can probably blame the success of The Beatles’ “Yellow Submarine” for most of these. Still, there’s nothing wrong with trying to peddle your wares to those damn dirty hippies. This week’s RFC Flashback is plucked out of order so that we can pay tribute to the late Dave Brockie, also known as “Oderus Urungus” of the band, GWAR. 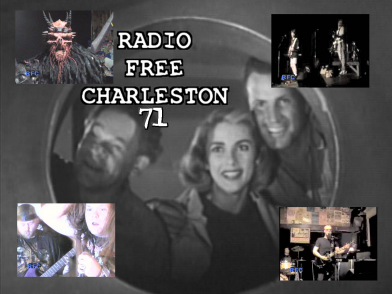 Dave was nice enough to have recorded a couple of spots for Radio Free Charleston, and you can see them, presented in character as Oderus, in this episode of RFC. We were lucky enough to meet Dave, and he was a nice, funny and humble man who just wanted to entertain people.It was a real shock to learn of his passing. Thanks to Bo Vance and Mad Man Pondo for helping make these videos happen. Radio Free Charleston number 71, “Golden age Batman Shirt” was originally posted in May, 2009. This episode of Charleston’s local music, film, animation and weirdness program included new music from WATT4, vintage music from Hitchock Circus, a Plant Ro Duction Mini Movie, and a special appearance from IWA East Coast‘s Mad Man Pondo and a friend. We concluded “Mark Beckner Month” with two songs from his Nashville band, Hitchcock Circus. This was a homecoming for Mark, who was a regular on the old RFC radio show as a member of Go Van Gogh and The Tunesmiths. 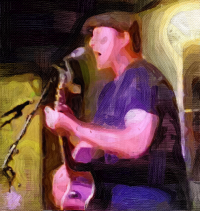 Mark has since rejoined with his brother, Stephen, to form The Nanker Phelge, who have a new CD coming out in a few weeks. WATT4 was recorded at The Blue Parrot. This line-up of the band is back together and is currently rehearsing for future shows. It’s a multi-topic PopCulteer this week. So let’s dive in! 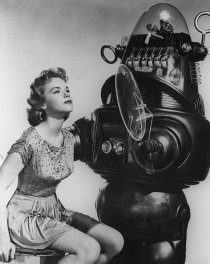 The showing of the classic film, “Metropolis” at the Electric Sky Theater at the Clay Center back in February was a success, so now they’re trying another Sci Fi classic. 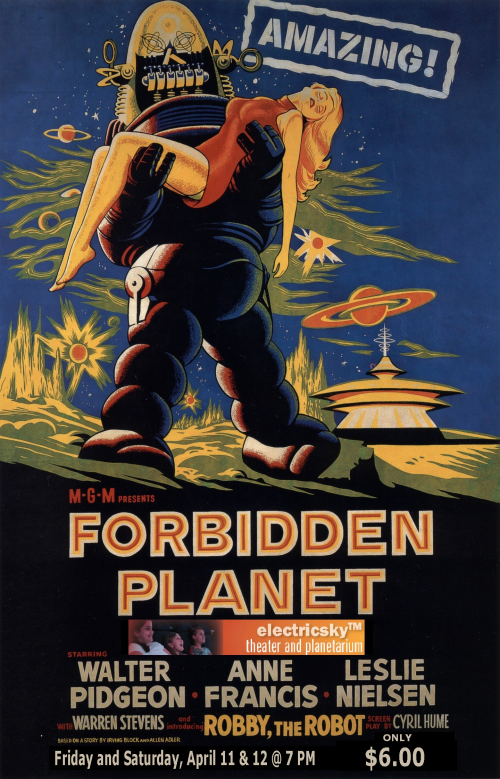 “Forbidden Planet,” the epic Sci Fi movie from 1956 that includes the debut of Robbie The Robot, a dramatic turn from Leslie Nielson and a monster animated by the folks at Disney, will be shown April 11 and 12 at 7 PM. The film runs 98 minutes and will be shown at The Electric Sky Theater. Admission is a mere six dollars. 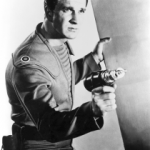 If you enjoy quality science fiction or classic movies, then you won’t want to miss the chance to see “Forbidden Planet” on the big screen. A starship crew goes to investigate the silence of a planet’s colony only to find two survivors and a deadly secret that one of them has. 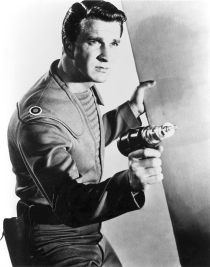 “Forbidden Planet” is the April installment of the Clay Center’s Science Fiction Film Series. Check PopCult for details on how you can help choose future films in the series. Welcome to our new readers who may have followed links here hoping to see the videos that we’ve posted covering JoeLanta and the Great Atlanta Toy Convention! You will find our big 38-minute wrap-up video at this post. You can also watch several of the panels and get a taste of the pre-convention tour packages by visiting this post. We hope you like what you see and decide to stick around for more PopCult stuff in the future. We will be posting photo essays from JoeLanta next week in this blog, so you can get a good look at some of the images that fly by in the videos. For our regular readers, expect a new PopCult Bookshelf next week. Your PopCulteer has been too busy editing video to catch up on his reading. There’s plenty to do in town tonight, so pack up your gear and make plans. 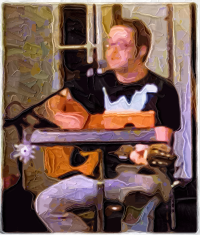 Starting at 8 PM, and with no cover charge, Third Eye Cabaret brings you a night of music featuring Mike Pushkin, Marium Bria, John Lilly and The Wegmann Brothers. This is a loaded line-up, filled with former and future guests on Radio Free Charleston. Third Eye Cabaret happens at The Cellar, 8 Capitol Street in Charleston. Plus, it’s Thursday and that means that Mojo’s will be hosting their cover-free comedy open mic, starting a little later than their normal time of 9 PM this week, but it’s still happening. Come to see the area’s up-and-coming comedy stars cut loose on stage. The second edition of Creekside Cafe’s “Wednesday Unplugged” happens tonight in Hurricane. Two recent RFC guests will present their music onstage in an intimate setting where the audience can interact and learn the stories behind the songwriting. Sheldon Vance and Terry “Cemeterry” Shultz will bring their acoustic punk to Creekside Cafe and open up the process to listeners. The show kicks off at 9 PM, and there is no cover. Tips are welcome, however. This promises to be a fun night of great music. The next Creekside Cafe “Wednesday Unplugged” will be April 9.